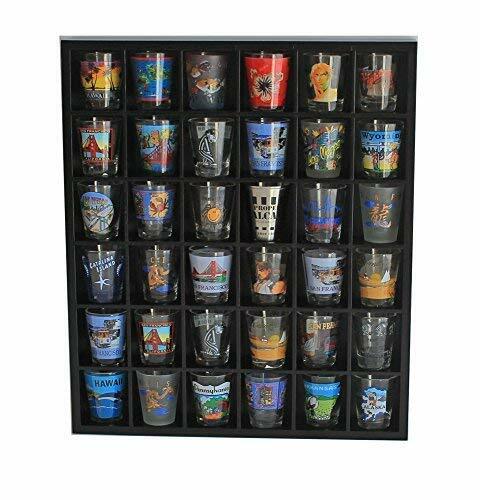 36 Slots Wall Curio for small collectibles, regular size shot glasses, and rock. Made with wood, stained black. Black Finish Wall Curio without door. Overall Measurements: 17"H X 14.5"W X 2.5" D (Outside). Slots are 2.25"H X 2.1"W X 2.25"D each. Shot Glasses And Curio Show in the cabinet are NOT included. For Demo only. Black Finish Wall Curio without door. Overall Measurements: 17H X 14.5W X 2.5 D (Outside). Slots are 2.25H X 2.1W X 2.25D each. Warning: This curio cabinet is only for Miniature curios or small rock samples display. Please measure the curio you have to make sure they fit the slots before you purchase. Material made of: ply wood, stained Black. Metal brackets on the back for hanging. You need hardware on the wall to hang. No Assembly required. Comes completed. Brand: DisplayGifts | Manufacturer: Display Gifts Inc. Display your collectables with pride in this lighted display cabinet. Mirrors are present on both back edges to enhance the lighting of your items and give more visual depth. The rich mahogany finish complements the simple straightforward design with tall vertical panes and decorative arch top. Two adjustable shelves are present in the upper cabinet that can be raised, lowered, or removed to suite your needs. Additionally, the lower cabinet also contains one adjustable shelf. 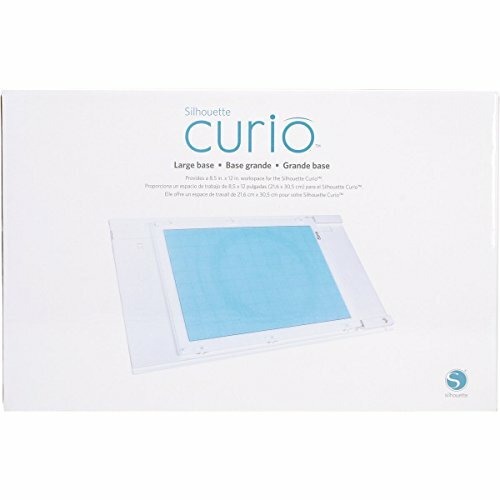 This lighted corner display is sure to become a cherished piece of furniture in your home. 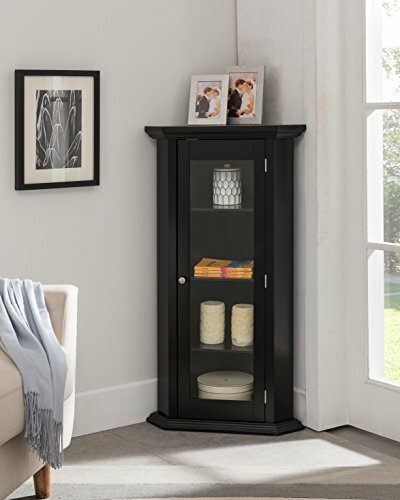 Kings Brand Furniture - Corner Curio Storage Cabinet with Glass Door, Black Finish. This Display Curio Cabinet is perfect for use all over the home for storage and display with modern style. This cabinet comes with 3 shelves. It has a metal handle for added style and easy to open door. 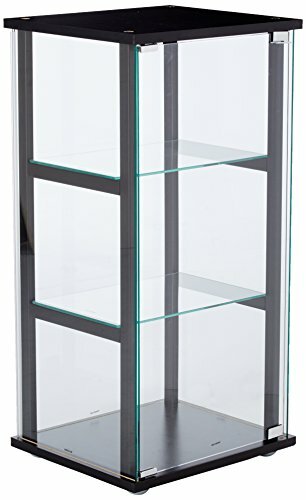 Corner Size: 16" x 16"
Height Between The 3 Shelves: 9.5"
Finish: Black; Clear Glass. Materials: Wood; Glass. 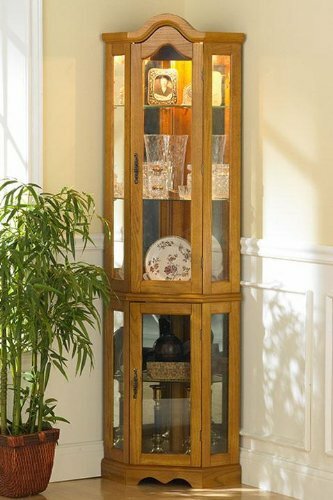 A perfect addition to your dining room, den, bedroom, or living room, this Coaster Company of America Clinton Curio Cabinet is a stunning way to showcase decorative items. Three tempered glass shelves provide ample space to showcase various pieces. Supported by a wood and glass structure, this curio cabinet is finished in bold black. Designed in an understated modern motif, a push-open door provides easy access. Dimensions: 16.75W x 14.25D x 33.5H in.. Made of glass and wood. Bold black finish. 3 glass shelves for storage. Understated modern design. Push-open glass doors. Place in den, living room, dining rom. Dimensions: 16.75W x 14.25D x 33.5H in. Go for a fresh new look with artistic influence. This curio cabinet turns design on its head with a new twist on tradition. Perfect for transitional spaces, its chrome support beams and cappuccino finish base and top nicely complement glass shelving and exterior panels. Three shelves clear the way for showing off your best decor. Upgrade a stylish living space with this fabulous find. 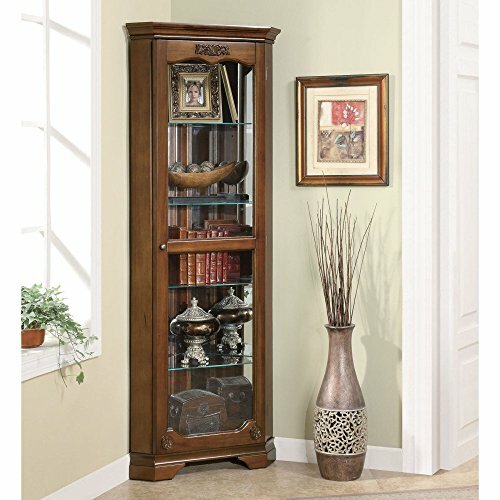 With this Coaster Furniture Eden Corner Curio Cabinet, you'll have an excellent place to hold and showcase decorative items. Supported by a solid wood structure, this curio cabinet is swathed in a golden brown finish. Four glass shelves provide ample storage and display space for your most beloved household pieces. Intricate carved detailing on the exterior of this curio cabinet underscores the elegant traditional motif. This curio cabinet also features an alluring leaf design on the top for eye-catching detail. Dimensions: 28W x 16D x 72H in.. Made of glass and wood. Golden brown finish. 4 glass shelves for display, storage. Traditional design elements. Intricate carved detailing. Alluring leaf design on top. Dimensions: 28W x 16D x 72H in. Product Description A great way to showcase your collectibles. 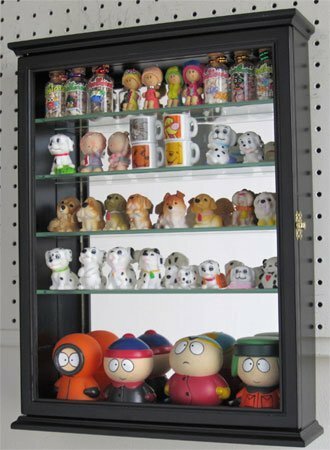 This display case comes with 5 removable shelves for different size figurines. Mirrored background creates an elegant contrast. Brass hinges and door latches. Wall brackets on the back for hanging (wall mounted). Hinged Glass door prevents dust and damage. Comes with 5 tempered glass shelves. No assembly required. 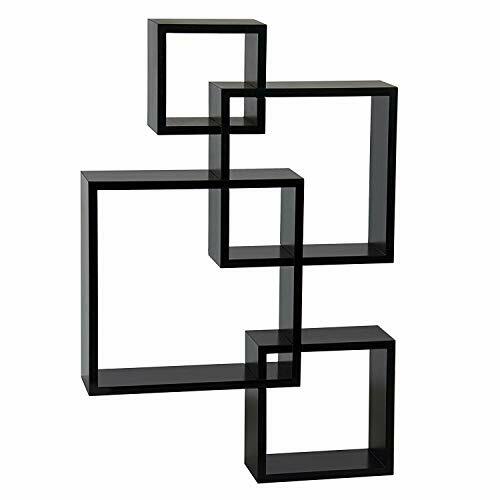 Dimensions: 18.5"H X 14.25"W X 3.5"D (Outside) Weight (net): 11 lbs Space between rows: 2.5" Interior depth: 2"
Our Black Intersecting Square Floating Wall Mounted Shelf Is Modern And Contemporary, Which Be A Great Additional To Any Home And Office. This Shelf Is Made Of 4 Different Squares That Are Attached Together To Form One Large Piece.And You Can Put Many Things On It, Such As Candles, Plants, Pictures, Books,Vases, Collectibles, And Much More. Moreover, It Would Be A Great Decoration To Your Living Space. Once Assembled, It Can Be Mounted On A Wall And Knick-Knacks Can Be Added On It. Do Not Hesitate To Buy One! Simple Assemble Required And All The Hardware Required. A Storage Shelf And Decoration To Home. Great For Putting Candles, Plants, Pictures, Books, Vase, Collectibles And So On. Made Of 4 Different Size Squares, Forming To A Large Shelf. 96% High-definition clear hydrophobic and oleophobic coating can prevent the water and from scattering. Water and oil can be wiped away very easily. 96% High-definition clear hydrophobic and oleophobic screen case coating protects against sweat and oil residue from fingerprints. The screen protector come with a cleaning kit. Please make sure keep the environment clean and remember not to fold the tempered glass film when installing. 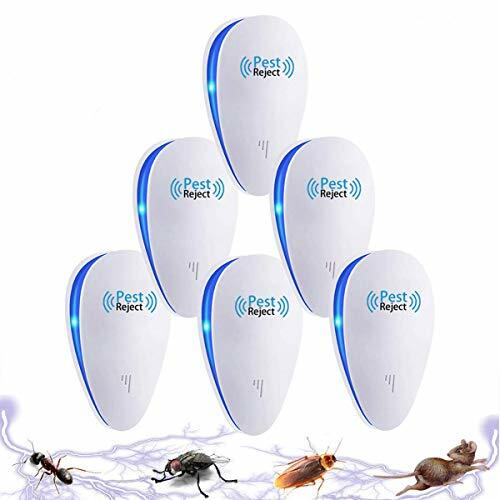 Multiple Protections It adopts premium quality AGC glass materials, thus creating an oil resistant, anti-fingerprint, Highly durable and scratch resistant surface that is easier to clean and protect against dirt, dust and sweat effectively. 3D Full Coverage With precise cutouts and unique 3D Curved full coverage cutting technology, it fits for the contours of your phone without warping and lifting. High Definition & Zero Delay 99% transparency and high definition allows an optimal natural viewing experience and keeps the bright image quality. Ultra thin-0.3mm thickness maintain the original sensitivity and comfortable touch feeling. Easy Installation With the installation steps and perfect fit design, it promises a super easy, frustration-free and bubble-free installation. Automatically attaches to the screen without annoyed bubbles and removed without residue. 100% Satisfaction Guarantee Our products are guaranteed to give you 100% satisfaction in every way for 180 days from the date of purchase. If you are not completely satisfied, email us and you will receive a replacement or refund. 1.Soft,long last,no shed,no tangle,no lice,no bad smell. 2. Natural hair line,bleached knots,with baby hair pre plucked hair line. 3. Hand tied hair ,natural looking lace frontal wigs. 4. High quality Swiss , strong and soft, never hurt skin,comfortable and durable. 5. Delivery Time: Fulfilled by Amazon just need 1-2 days to delivery. The default shipping method is Epacket(USPS).It will take about 10 working days to US.If you need the hair very urgently,please choose the shipping method:DHL.That only take 3-5 working days. 1. Hair Material: Synthetic Font Wigs. 2. Hair Density: 180% Density. As the pictures. 3. Cap Size: FLEXIBLE & ADJUSTABLE-Average Cap Size(21-23.5Inch) With Adjustable Straps and 3 Combs. 4. Hair Color: Black Color Hair Wigs. 7. Hair Grade: Synthetic hair heat resistant up to 160 degrees centigrade (320 Degrees fahrenheit). 8. Texture: Body Wave Hair Synthetic Wigs As pictures. 1. 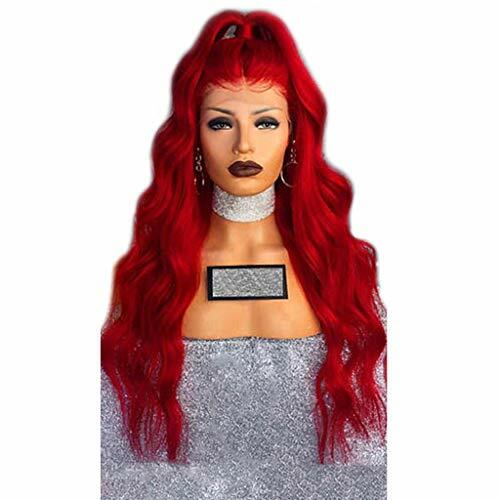 The wigs can be returned with full refund in 30 days as long as it is in it's original condition. SO please don't cut it! Thanks! We Love Our Customers! Please Feel Free to Write to Us If You Have any Other Concerns and We Will Be More Than Happy to Answer Them for You Less Than 4-6 Hours Because of Time Different. 24 Hours Online Service,After-Sales Service Guarantee.If You Have Any Questions,You Can Feel Free To Contact Me.I Will Do My Best To Help You.